Businesses of every size and type can benefit by quickly conveying your company’s prestige and success in just one look. Everyone who enters your office or building will be in awe of the fountain that showcases your business name or logo. Adding a custom indoor fountain or wall fountain to your office is easier and more affordable than you might think and given the array of positive benefits it’s sure to provide, you’ll make your money back ten-fold – and in no time at all. You can incorporate your company logo or business slogan on corporate indoor fountains of every size and style. You can choose slate, stainless steel, acrylic, copper, glass or a combination of materials to create an indoor water fountain for your business that will have your clients coming back for more. You can also choose from a corporate branded free-standing floor fountain, wall fountain, or logo-bearing table-top fountain and then personalize these to create an advertising median that will impress your clients like no other. And, with increased quality of air and a sense of relaxation, your employees will quickly notice a reduction in their stress levels, freeing them up to perform more optimally. 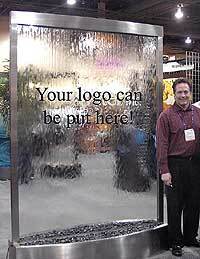 Best of all, there’s simply no better way to “brand” your office than with a stunning waterfall complete with your company logo or crest in the middle of your entranceway, waiting room or commons area. But if space is in short supply, you can create a unique office atmosphere by adding tabletop fountains to reception areas, conference areas, boardrooms and in individual offices. Because the fountains are calming, you can count on them to make your staff more productive and your clientele more at ease, creating a unique win-win situation that will positively impact your bottom line. You can also create a more stress relieving environment for your meeting room while adding beauty, elegance, and office practicality. You probably never would have thought of it, but fountain designers did. The stunning allure of a stainless steel wall fountain combined with a dry erase whiteboard. The dry erase board is stored behind the unit and can easily be pulled out and attached over the front of the water panel when needed. Logos Can Be added to many of the floor and wall fountain styles. Make sure to look for the option. Large and Unique Selections – Many indoor fountain sites have a very limited selection of styles and models, and nothing unique to them. The sites we have recommended have the largest selection we have seen so far, and each has many offering that is unique to them. Free Shipping – These Merchants offer free shipping to your home or office, within the continental United States (some restrictions may apply). That is a huge benefit, especially with the larger fountains. Secure Shopping You Can Count On – These online merchants have gone to great lengths to provide you with completely safe and secure shopping and check out – just one more step that is taken to ensure your complete satisfaction. Industry-standard Secure Sockets Layer (SSL) technology is used to allow for the encryption of potentially sensitive information. Information passed between your computer and their web site cannot be read, even in the highly unlikely event, it is intercepted by someone else.